Nelson purchased additional adjacent lands and at the time of his death owned over 160 acres – all of which is described in this booklet. Several descriptions of the house and its extensions are discussed in the next chapters and reference is made to the existing street plan to give readers a better mental picture. The final story of Merton Place is sad. Nelson’s death, Emma’s debts, the estate’s neglect and final demolition enabled the inevitable Victorian urban sprawl to remove all traces of Nelson’s life in Merton. Recommended. 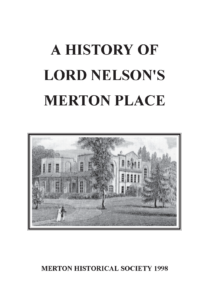 This study contains much new material, not found in the standard biographies, and corrects some common errors that have appeared in accounts of Nelson’s life at Merton. different, hardly reaching into Merton at all. Goodman for pointing me to more reliable sources for Nelson’s letters. challenge the assertions that I have made. There are many conflicting accounts of the origins of Merton Place. previously applied to the predecessor of Church House opposite St.
wall of the former Merton Priory, but he had not owned Merton Place. formerly called Moat House Farm. owned theMerton Abbey estate that was eventually owned by Hubbald). clear, and in the possession of Mark Hawkins. increased to £500 brick, £250 timber. the East India Company, whom he accused of bad management. Interestingly, this was not the first contact between Hotham and Thrale. from his father, Ralph Thrale (see p.10). by 11 votes at the 1784 election by a director of the East India Company. and after his death in 1799 the scheme collapsed. residue of my personal estate. with Park Paling and remarkably fine live Quick Fences. ditch, which keeps the whole place damp. 9960, Croker collection in the Phillipps papers. 36 Carola Oman – Nelson (1947), p.501. 37 Public Record Office (Kew) IR/24/35/23288. 41 Wimbledon Society Archives – Deed A2:3. 42 M Eyre Matcham – The Nelsons of Burnham Thorpe (1911), p.200. 43 Carola Oman – Nelson (1947), p.603. 44 Lambeth Archives Department, Minet Library Deed 12386 – Photocopy of deed. 45 Rev. J.E. Jagger – Lord Nelson’s Home and Life at Merton (1926) p.5. 46 Rev. J.E. 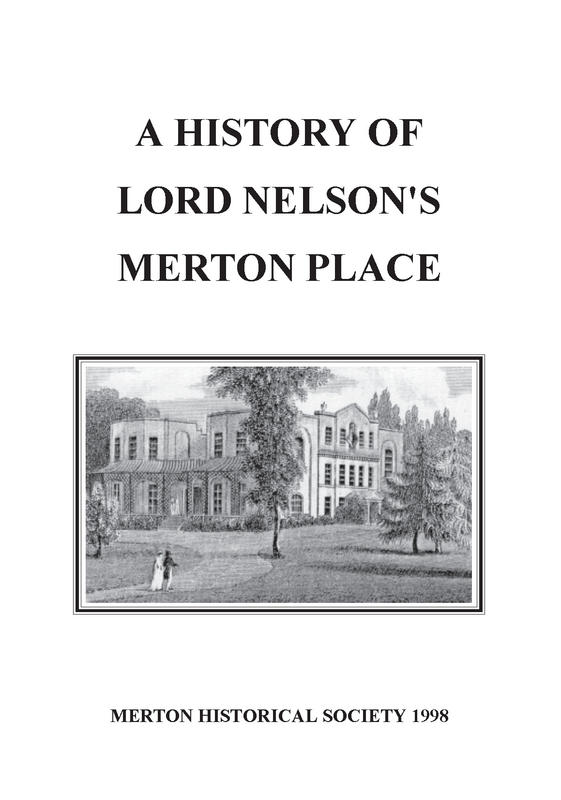 Jagger – Lord Nelson’s Home and Life at Merton (1926) p.22. 47 Copy in Merton Local Studies Centre, Civic Centre, Morden. 48 Surrey Record Office 3185/4/14. 49 Surrey Record Office microfilm. 50 Edward’s Companion from London to Brighthelmston (1790) – p.8 Section XI. 51 Douglas Sladen – Lord Nelson’s Letters to Lady Hamilton (c1900), p.131. 52 Carola Oman – Nelson (1947), p.583. 53 Rev. J.E. Jagger – Lord Nelson’s Home and Life at Merton (1926) p.17. 55 W H Chamberlain – Reminiscences of Old Merton (1925), p.27. Notebook in Merton Local Studies Centre. 58 Carola Oman – Nelson (1947), p.497-498. 60 Carola Oman – Nelson (1947), p.584. 61 Carola Oman – Nelson (1947), p.587. 62 Kathleen Denbigh – History and Heroes of Old Merton (1975), p.94-95. 64 Carola Oman – Nelson (1947), p.679-680. 2 A History of the County of Surrey (1911), IV, p.66. Evelyn M Jowett -A History of Merton & Morden (1951), p.101. 4 Lambeth Archives Department, Minet Library Deed 3764. 5 Wimbledon Society Archives – Abstract of Title to Deed A2:4. 6 Sun Insurance Policy 74383 – Guildhall Library Q2.8674/81 (I3), p.207. 7 Public Record Office PCC/PROB. 11 1322 fo. 271. 8 David Burns -The Sheriffs of Surrey (1992), p.31. 9 Gerard Young – A History of Bognor Regis (1983), pp.1-13, &c.
10 Wimbledon Society Archives – Deed A2:1. 11 Lambeth Archives Department, Minet Library Deed 3765. 12 Public Record Office PCC/PROB. 11 1352 fo. 26. 13 Guildford Muniment Room 85/2/1(1) 42. 14 Jack Russell – Nelson and the Hamiltons (1969), pp.227-8. 16 Wimbledon Society Archives – Deeds A2:1 & 2. 17 Carola Oman – Nelson (1947), p.482-483. 18 Carola Oman – Nelson (1947), p.483. 19 Carola Oman – Nelson (1947), p.603. the National Maritime Museum, Greenwich. 21 Wimbledon Society Archives – Deeds A2:6 & 7. 22 Public Record Office PCC/PROB. 11 1663 fo. 585. 24 Guildford Muniment Room 85/2/1(1) 103. 25 Merton Local Studies Centre, Civic Centre, Morden. 26 Lambeth Archives Department, Minet Library Deed 3764; cf. 5849, 5850. 29 Lambeth Archives Department, Minet Library Deed 5844. 30 Guildford Muniment Room 85/2/1(1) 147. Wimbledon Two Hundred Years Ago (1996), p.48. 33 Home Counties Magazine III (1901), p.209. 34 James Harrison – Life of the Rt Hon Horatio Lord Viscount Nelson (1806), p.377. ever saw pretending to suit a Gentleman’s family. as it stands the more you will oblige. 1801, following Nelson’s return from sea. never saw so many conveniences united in so small a compass. You have nothing but to come and enjoy immediately. 1803, and Nelson had also borrowed from family and friends. Lodge, and Merton Place was offered for sale by private treaty. for sale in 1815,and in 1823 (figure 1). paddock and the small mound on which Nelson was wont to sit. Dorking, in the County of Surry. 4. A Ditto adjoining backward, 50 Feet in Front, 50 Feet behind and about 106[?] Feet deep. 5. A Ditto, 50 Feet in Front of the high Road, 50 Feet behind, about [??] Feet deep adjoining Lot 3. 6. A Ditto adjoining backward, 50 Feet in Front, 50 Feet behind and about [?] Feet deep. 7. A Ditto, 50 Feet in Front of the high Road, 50 Feet behind, about 502 Feet deep adjoining Lot 5. 8. A Ditto adjoining backward, 50 Feet in Front, 50 Feet behind and about 107 Feet deep. 9. A Ditto, 50 Feet in Front of the high Road, 50 Feet behind, about 502 Feet deep adjoining Lot 7. 10. A Ditto adjoining backward, 50 Feet in Front, 50 Feet behind and about 110 Feet deep. 11. A Ditto, 50 Feet in Front of the high Road, 50 Feet behind, about 502 Feet deep adjoining Lot 9. 12. A Ditto adjoining backward, 50 Feet in Front, 50 Feet behind and about 116 Feet deep. 13. A Ditto, 50 Feet in Front of the high Road, 50 Feet behind, about 502 Feet deep adjoining Lot 11. 14. A Ditto adjoining backward, 50 Feet in Front, 50 Feet behind and about 122 Feet deep. 15. A Ditto, 50 Feet in Front of the high Road, 50 Feet behind, about 502 Feet deep adjoining Lot 13. 16. A Ditto adjoining backward, 50 Feet in Front, 50 Feet behind and about 128 Feet deep. 17. A Ditto, 50 Feet in Front of the high Road, 50 Feet behind, about 502 Feet deep adjoining Lot 15. 18. A Ditto adjoining backward, 50 Feet in Front, 50 Feet behind and about 134 Feet deep. 19. A Ditto, 50 Feet in Front of the high Road, 50 Feet behind, about 502 Feet deep adjoining Lot 17. 20. A Ditto adjoining backward, 50 Feet in Front, 50 Feet behind and about 140 Feet deep. 21. A Ditto, 50 Feet in Front of the high Road, 50 Feet behind, about 502 Feet deep adjoining Lot 19. 22. A Ditto adjoining backward, 50 Feet in Front, 50 Feet behind and about 145 Feet deep. 23. A Ditto, 50 Feet in Front of the high Road, 50 Feet behind, about 502 Feet deep adjoining Lot 21. 24. A Ditto adjoining backward, 50 Feet in Front, 50 Feet behind and about 150 Feet deep. Garden Fence, and adjoining Lot 23. 26. A Ditto adjoining, 70 Feet in Front, 73 Feet behind and about 544 Feet deep. 27. A Ditto adjoining, 80 Feet in Front of the high Road, 73 Feet behind, about 305 Feet deep. at a large Expense, and includes the lofty Wall to the extent of 80 Feet. advantage of a portion of the Pond therein. UPON THIS LOT THE MANSION RECENTLY STOOD. and the Well will be included in the present Purchase. 29. A Ditto adjoining, 70 Feet in Front, 84 Feet behind, and about 360 Feet deep. healthy ornamental Trees, and Part of the Wall. 30. A Ditto adjoining, 80 Feet in Front, 80 Feet behind and about 400 Feet deep. This Lot adjoins the last, and is presumed to have similar advantages. and extending to Abbey Lane. was valued at £220, it cannot have been entirely of brick. south, the subject of the 1805 plan, which appears to be single-storey. of Sale25 say of Lot 28: UPON THIS LOT THE MANSION RECENTLY STOOD. it stood in 1½ acres of land, south of the turnpike road. purchased from Henry Thrale in March 1769. Tithe Apportionment map of 1848 as plots 289-298.
etc. A dairy, salting-house, ice-house and capital cellaring. Rooms are two spacious Verandas. show few obvious differences, other than 3 extra servants’ chambers. (from a sketch made by John Wallace). which Hotham totalled more precisely as 52 acres 1 rood 37 perches. from Pinhey’s Rose Cottage and one field owned by Reuben Fletcher. and a Mr. Chawner, who had completed the work started by a Mr.
place extremely well and without his knowing she was about it. She is a clever being after all: the passion is as hot as ever. looking-glass to view himself all day is bad taste. a profile [of the Crown Prince of Denmark]…. to me the Battle off Copenhagen. superimposed on the Tithe maps. location within Wimbledon parish, opposite the walls of Merton Priory. been at the southern end of the plot, bordering on the London Road. principal Bed Chambers and a Water Closet. a neat Vestibule and capital principal Staircase. Catticombs [sic], cellaring and numerous Conveniences. cottages for Lord Nelson at Merton in Surry. skirted by extensive shrubbery walks. and cottages were in this area. Particulars of Sale,25 which extended to Abbey Lane (figure 1). has often been through it. Now all is gone. about the proximity of neighbours, for he began buying additional lands. Axe liberally consented to sell for … £8,000. acres in Merton can be deduced from maps of neighbouring estates. Road and Deer Park Road on the east (figure 14). Paddocks of fine Grass Land. please God soon see it all. Nelson, Hamilton, Hardy, Trafalgar and Victory. on Australasian soil, having served with Captain Cook on theEndeavour. detached villas”, though a note at the foot of the Particulars of Saleinforms us that “the 23 Freehold Lots offered in the last Sale are Sold”. Nelson’s’ divided into several assorted plots, with a few buildings. formerly part and parcel of a piece of land called the Vines. the actual site of Merton Place. November 1802 from William Axe, Ann his wife, and Samuel Axe. under her hand and seal. west was divided between several owners. of same altogether or in parcels. acceptable offer be made for the whole by private contract. perches, more or less, enclosed with extensive Park Paling. now in the occupation of Mr Taylor, Tenant at Will. Figure 8 – Map of Lady Hamilton’s Merton Place estate 1805 – 1808. Cracklow’s plan of 1806 superimposed on the Tithe maps. last remnant of which survived to the 1950s. Nelson deceased, now or late in the occupation of the said – West. on the south by a common footpath [i.e. Quicks]. perches, owned by Reuben Fletcher, represents West Lord’s Lease. together seventy acres or thereabouts, and are all Freehold. This entry was posted in Publications, Booklets, Publications and tagged in 19-century Merton, merton, nelson.